The vast majority of orders we produce, do not have color added to their awards and gifts. Glass and crystal in particular are traditionally engraved and presented without color. This traditional engraving is both elegant and classic. However, about 20% of our orders have color fill added. These added touches of color can add a lot to your award. Sometimes the colors are pulled from your logo and sometimes from an event theme. Watch this short video about adding color to your awards. This overview will give you more information about what can and can’t be done when adding color fill to your order. If you have questions at any time about whether you can add color to the award you are considering, what it will cost or how long it will take to produce, please don’t hesitate to contact our Customer Service team for assistance 800-753-3384. 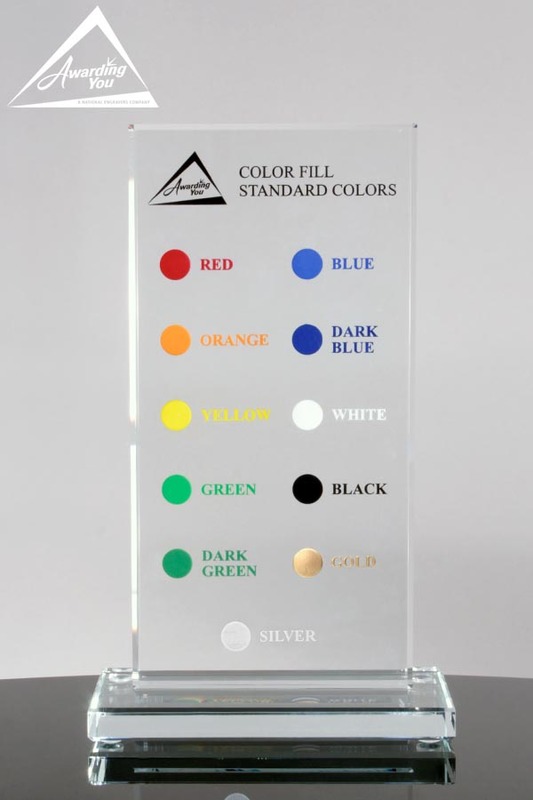 When talking about adding color to your award or gift, we need to first separate crystal and glass products from plaques. In general , we either get asked to add one or two basic colors to an award, say for the logo and text, or we get asked to color fill the logo with Pantone Colors from the client’s corporate brand standards. First, we’ll have to review the award you’ve chosen, your logo, and the amount and size of the text to be engraved. To be able to paint fill, we often have to modify the logo slightly (increasing line widths, and we often have to create the areas to be filled by adding raised “borders around an area”). In most cases of color filling, we will engrave the logo, image or text on the back of the award. This is particularly true for complex logo designs that need to be filled and for logos that have large color fill areas. In some cases if we are just color filling text on an award, and it is a basic one color fill, we can engrave on the front of the award and color fill on that side. Basic colors: We have a variety of basic standard colors that can be used for paint filling. If you want your text in red, and your logo in a royal blue, we will be able to do this without Pantone Matching. We can produce a sample with the color fill for your approval as long as the time on your order allows for this extra step. This image to the right shows swatches with a general representation of our standard colors. Please keep in mind the exact paint color is difficult to capture using digital media. Pantone Matching: we cannot match Pantone colors exactly (if you were to put them in a light booth for testing…the color wouldn’t pass). However, we can come very close. This has been generally acceptable to all clients. Pantone Match Fee: there is a one-time fee of $50 per color. This allows us to find the right formulation to use for each color. We will produce a sample with the colors for your approval as long as time on your order allows for this extra step. In most cases, an order with color fill, will take an additional 1-2 weeks production time over the standard production time for the award without color fill. In general, this means 2-4 weeks production total, depending on the award, quantity, and complexity of the color fill request. Paint fill in the last step before final QA and packing. This allows time for the work to be completed, and sufficient dry time for the paint. In general, color fill adds between $15-30 per part. The additional cost comes from a combination of additional time to color fill (which is a hand process), and the additional set up for engraving on the back side of the award. To get the exact cost for your color filling your award, please call our Customer Service to discuss your requirements. Silver fill can be added to your text or logo, on glass and crystal awards. Watch this short video to learn more about silver fill. This fill is sometimes used when there is a lot of text to read. It will enhance the copy just enough to make it pop out a bit more. 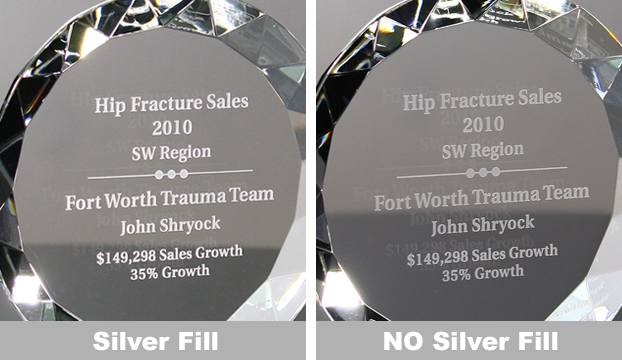 Below is an image that shows the same award with and without silver fill. The cost to add silver fill is $7.00 per award. Single Color Top Plate: we have a variety of plaques that use red, blue or green marble colored top plates for engraving. These are more traditional looking plaques. An example of this is our Kreiger plaque. These top plates are only available on certain plaques, so please check the plaque section to look for these single color top plate options. There are no additional charges for set-up on these single color top plate orders, and generally production time is 2 weeks for your order. Full Color Top Plate: we use a technology called sublimation to create the full color image with your award text, on the top plate. The technology uses a combination of special inks, heat and pressure. This top plate is then mounted to a back plate and the wood board to create your plaque. An example of our full color plaque option is the Oxnard. These plaques are available in a wide variety of sizes. With sublimation is not possible to do Pantone Matching, although we can generally come very close. Historically, we have come close enough to all requested Pantone colors to get these approved. We will run a sample of the plate design for your approval as long as there is time in your order to do so. There is a one- time Art Set-Up Fee to create the design layout for your plaque order (ranges from $75-$150). For Quantities less than 5 pieces, there is a 10% Up-Charge per piece on your product price. Generally production time is 2-3 weeks for full color top plate plaque orders. Approximately 1 week of that time is used for the design and approval of your layout, and the last 2 weeks for production of the product. We also do have some full color plaque options that use stock images you can choose from. Examples of this would be our Full Color Oak Tree Plaque and our Full Color Globe Plaque. In these cases, the background images are already set- up, and you just send us your award text to add to the plaque. There are no additional charges for the Art Set Up Fee, or for less than 5 units. Our Tesla series of plaques have glass top plates that be engraved and color filled, on one side, or both sides. One sided: This is our Standard Tesla Plaque Series where we engrave on the top of the glass and then fill with color paint. Two sided: An example of this is our Tesla Star Plaque where we engrave the 3 stars on the underside of the glass plate, and the award text on the top of the glass plate.